The Samsung UN60FH6003 provides a large screen without all of the extra features in order to keep the price down. You don't get any sort of 3D playback or smart TV functionality here. What you do get is a 120Hz refresh rate. If you are a sports and movie lover, this is all you really need. The design is nothing special, so it won't be the star of your living room. There is also a lack of HDMI inputs here. One more would have been a nice inclusion, but that is a minor flaw. All in all, this is a TV designed for the value shopper who isn't interested in all sorts of upgrades. It's a bare bones TV with solid picture quality and a fast refresh rate. The FH in the model number denotes that this model doesn't use edge-lighting for the LEDs. The 60FH6003 uses direct lighting, meaning the LEDs are behind the panel. As the technology has been advancing, noticeable differences between the two setups have been harder to spot. Screen uniformity and side angle viewing are slightly better, but problems still exist for those who are looking. The benefits are seen in the bright back lighting. This helps colors to pop and peak whites to be super bright. Contrast is also a high point, but it doesn't compete with top tier LEDs or plasma displays. The UN60FH6003 uses a 120Hz refresh rate panel to produce a smooth and clear picture for fast action and live sports programming. It is a nice feature to have included on this value oriented model. Fast action judder is significantly lessened with a high refresh rate panel like this one. Benefits are best seen in sports programming and scenes that have slow panning camera movement. Video games also benefit from the 120Hz panel since there is usually a lot of fast camera movement and action on screen. 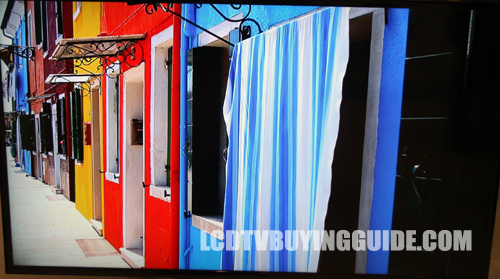 For an edge lit LED television the side angle viewing performance on the UN60FH6003 is not bad, contrast begins to fade around 30 degrees which is a good result for an edge lit LED television, but is helped in 2013 by the wide color enhancer plus technology that is built in to the FH6003 series. The Samsung UN60FH6003 has a very familiar appearance to it. We saw the same exact design from the EH series last year. We aren't expecting and significant flare when it comes to the value series, but something to set them apart from last year would have been nice. The cabinet has a depth of 3.7 inches thanks to the direct LED lighting. That's nothing to get upset about, but edge-lit LED TVs shave about an inch and a half off of that. The square black plastic stand is nothing flashy either. This is one of the major gripes about the TV. There are only 2 HDMI ports. That may not be a major flaw, but one more input for a TV that could likely be the center of a home theater would have been nice. An HDMI capable A/V receiver is a good solution, but there are sometimes issues with cable boxes. Just be aware of how you want to set it up. The worst scenario possible is having to switch cables out every once in a while, and that's not so bad. 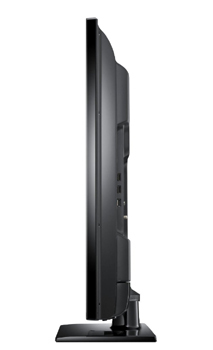 The Samsung UN60FH6003 stacks up to be a solid value at $1000 for 60 inches of screen space. The FH6030 is not offered in this size, so there isn't a direct comparison price wise. 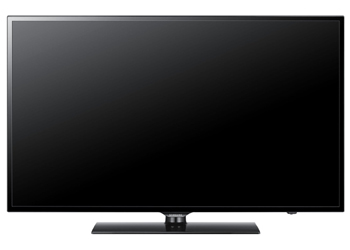 The FH6003 offers solid picture quality with a refresh rate that will satisfy action movie and sports lovers alike. Some competition to be aware of comes from the LG 60LN5400 that sells for a similar price and the Sharp LC-60LE550U for a little less. The picture on the Sharp ends up looking flatter, but they are known for their long term reliability. Size (W x H x D) Without Stand: 54.1" x 31.5" x 3.7"
Size With Stand: 54.1" x 33.9" x 12.9"
Weight Without Stand: 50.7 lb. Weight With Stand: 60.0 lb.